A sneak peek at the new book. 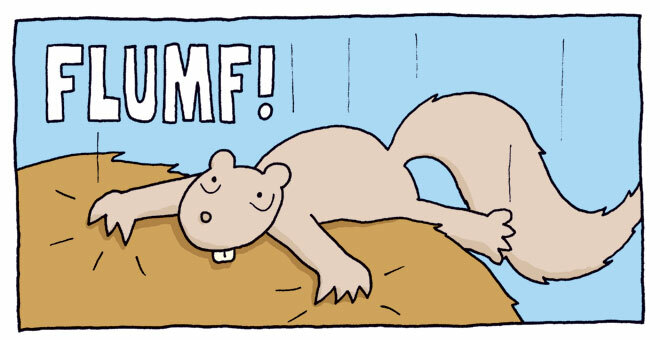 Flumf is the sound of a squirrel making a soft landing. 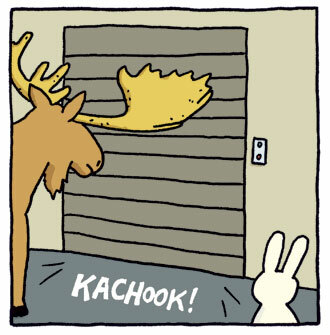 For the past month or so, I’ve been putting the finishing touches on Laser Moose and Rabbit Boy: Disco Fever. Last week, I got some final questions from Jean, my editor – and one of the questions that I thought was pretty fun was about my use of “Augh!” and “Argh!” in the new book. This Savage Chickens comic features my favourite fart sound: Pfarp! It was something I hadn’t thought about before. How do I use those words? I looked into it and was surprised to discover that I use Augh and Argh fairly consistently in my comics. To my ears, “Augh” is a scream – usually involving fear or pain. “Argh” is more of a yell, and I associate it with anger and frustration. They’re both made-up words, of course, but this is what they mean to me. Pfarp! – My favourite fart sound. Brap! – My favourite belch sound. Thwack! – A smack in the face. Ponk! – Punching a robot. Gak! – Coughing up a hairball. Schluck! – Popping in a contact lens. Plurp! – A bird pooping. Pffff! – Spitting water out. I’m stepping up my sound effects game in the new book. In addition to the above Flumf, you’ll see: Thup! Screee! Shflunk! Pssh! Shtook! Glub! Splorsh! And Glurp! Kachook! The sound of a garage door closing. And now I’m finding myself watching out more for sound effects when I’m reading other people’s comics. I was very excited to discover a “Hurkk!” in my friend Jason’s new graphic novel, Fir Valley! What’s your favourite sound effect?